The 15-year-old 'Opportunity rover' was last heard from on June 10, when it went into "sleep" mode as dust blocked out the Sun and darkness enveloped Mars. 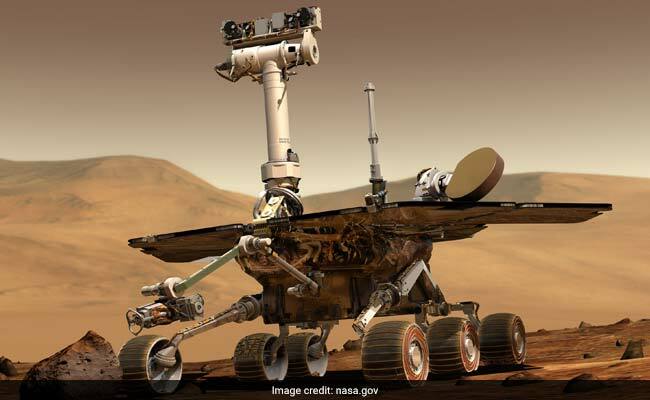 Opportunity, twin rover, Spirit are a pair of unmanned robotic vehicles to tool around on Mars. NASA scientists can now see their solar-powered probe that was lost in a Martian dust storm more than 100 days ago -- but the vintage robot hasn't shown any signs of life. Thanks to a high-resolution camera aboard the Mars Reconnaissance Orbiter, NASA said Tuesday it can see the Opportunity rover in Perseverance Valley, on the edge of a huge crater. Opportunity was descending into the valley when a dust storm that was first detected May 30 swept over the region. In NASA's image, the vehicle appears as a tiny white dot. The 15-year-old rover was last heard from on June 10, when it went into "sleep" mode as dust blocked out the Sun and darkness enveloped the Red Planet. "NASA still hasn't heard from the Opportunity rover, but at least we can see it again," NASA's Jet Propulsion Laboratory said in a statement. They landed on Mars in 2003 on a mission meant to last 90 days and span 1,000 yards (meters). Opportunity is going on 60 times its planned mission life, has traveled 28 miles (45 kilometers) and found evidence of water on Mars and conditions that may have been suitable for sustaining microbial life. Last month, NASA said it would work until mid-October to try to bring Opportunity back to life, a timeframe fans of "Oppy" said was too short.